Next up this week, the first program in a new series I'll drop in on occasion over the next few months. "Ways of Mankind" is a previously uncirculated show among otr collectors and has an unusual history. It was produced in 1953 by the National Association of Educational Broadcasters for two 13-episode series. It was one of the first programs produced by the NAEB with a $300,000 grant from the Ford Foundation. Written by Walter Goldschmidt, an anthropologist at UCLA, "Ways of Mankind" was a dramatized documentary series that looked at different aspects of human cultures. It used actors in vignettes and the style might remind you some of Norman Corwin's documentaries produced in the 30s and 40s. The series was well received and circulated up into the early 1960s - in 1963, two episodes were released on Folkways records. I found a blog post reproducing a 1963 article with an appreciation of "Ways of Mankind" and other NAEB series. The entire run of the two "Ways of Mankind" series - 26 shows - was released by the NAEB on lp records for libraries sometime in the 1950s. The NAEB dissolved in 1981 and their records at located at the University of Maryland's National Public Broadcasting Archives. However, I'm not aware of any archival effort to preserve shows that were produced by the network. So, premiering on the blog this week and unheard since it was originally syndicated in the 50s and 60s, we hear the first program in the series, "A Word in Your Ear", a piece that looks at the ways language reflects cultures and societies and changes over time. 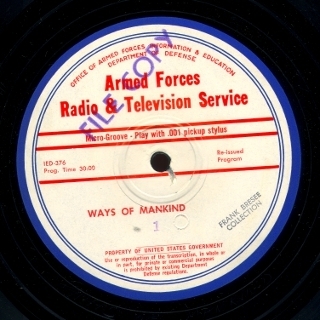 The show was transferred from an original AFRTS vinyl microgroove transcription dating from around 1961. My thanks to Michael Utz, whose assistance helped me obtain this set of discs for my collection. I've got about a half-dozen programs in the series that I'll post in the coming months. The NAEB would seem like an untapped area for an enterprising old time radio researcher since their syndicated series aren't well documented. Walter Goldschmidt is still around - how about someone calling him up to see if he'd participate in an interview about his work with NAEB?